Learn how to create, run and export reports for your Communico modules. You can preview, sort and filter your reports before exporting too. We've put together an overview video to get you started, plus there's a user guide covering reporting features and options. It's easy to create reports for your Communico modules. You can customize reports, add fields and filter to include just certain criteria. See a live preview before running reports and export to csv or pdf format. It's all covered here. Learn the basics of Reports with step by step illustrated guides. The control panel Reports section is where you create and run reports for your Communico modules. The Communico Reports system allows for quick report creation and running. .You can run reports for Attend, Reserve and event registrations. 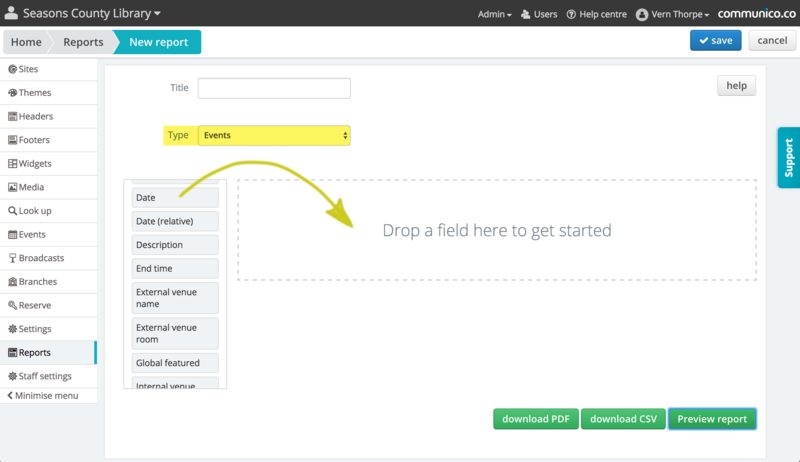 Any fields associated with a module can be dragged into a report. In the Reports section, click the New report button. Choose a report type then start dragging in fields. Build your report up using the fields available for your Report type. By default fields will include all information, but some fields have criteria that allow you to filter further or options for setting ranges or multiple selection. Drag and drop to reorder your fields (The final report will show the top field as the first column). Checking the show option will display this field in your final report. You can hide it from being displayed by unchecking. Fields can be sorted within your report. You can cycle throught the sort options by clicking on the arrows which will sort ascending to descending, decending to ascending depending on the field type, (Alphabetically or by value). If multiple fields are sorted, then the closest to the top of your form takes priority. Built up your report and at any time you can click the Preview report button to see how the info will be displayed. Once your report is complete make sure you save it and give it a title. You can then export the report as a csv or pdf file by clicking the download buttons. Fields available for Events reporting, what they do and their options. The age group field will include all age groups by default. 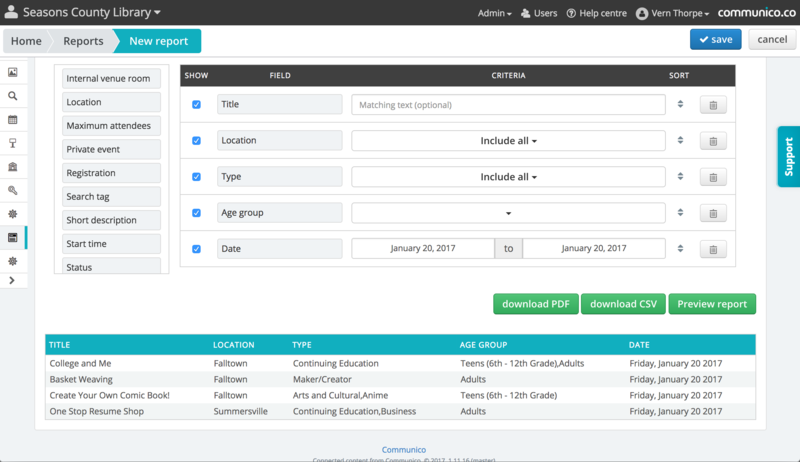 Click the dropdown to reveal your library's event age groups and you can select, or multiple select, individual age groups to be included in your report. If you have branch featured events you can choose Yes to include these events or No to exclude them from the report. The Changed field will include all changed events by default. Click the dropdown to reveal options. You can choose to include canceled and rescheduled events in your report. No will not include any changed events. This field will include the text that was entered for the event change reason. The Contact field will include all event contact names by default. Click the dropdown to reveal a list of all contact names where you can select, or multiple select, individual contact names to include in your report. The Creator field will include all event creator names by default. Click the dropdown to reveal a list of all creator names where you can select, or multiple select, individual names to include in your report. The Date field will default to the current date. Use the date picker to select a date range for events to include in your report. The relative date field allows you to select a predefined date or date range relative to the current day. The default is Today. Click the dropdown to reveal options for Yesterday, Last week, This week, Next week, Last month, This month and Next month. These options give a quick way of running a regular report. This will include the event's end time. If the event is taking place at an external venue you can choose to include the venue name. There is the option to type in a venue name to just include individual that external venue. If the event is taking place at an external venue with a room name, you can choose to include the venue room name. There is the option to type in a room name to just include that individual room. If you have global featured events you can choose Yes to include these events or No to exclude them from the report. If the event is taking place at an internal venue with a room name, you can choose to include the venue room name. There is the option to type in a room name to just include that individual room. The Location field will include all event locations by default. Click the dropdown to reveal a list of all locations where you can select, or multiple select, individual locations to include in your report. This field will display the maximum attendees for each event. There are options to narrow this down by entering a maximum attendee number then selecting Equal to, Greater than or Less than. If you have Private events you can choose Yes to include these events or No to exclude them from the report. If you have Registered events you can choose Yes to include these events or No to exclude them from the report. (You can also run reports on just registrations using the Registrations report type). The Search tag field will include all search tags used by default. Click the dropdown to reveal a list of all search tags where you can select, or multiple select, individual tags to include in your report. This will include all the event's short descrption text. The Status field will include all event statuses by default. Click the dropdown to reveal a list of statuses where you can select, or multiple select, Draft, Changes requested, In review, Published and Unpublished to include in your report. Choose to include the event's sub title. There is the option to type in a sub title to just match and include events with that sub title. Choose to include the event's title. There is the option to type in a title to just match and include events with that title. This field will display the total attendance for each event. There are options to narrow this down by entering a number then selecting Equal to, Greater than or Less than. This field will display the total registants for each event. There are options to narrow this down by entering a number then selecting Equal to, Greater than or Less than. This field will display the total number on the waitlist for each event. There are options to narrow this down by entering a number then selecting Equal to, Greater than or Less than. The Type field will include all event types by default. Click the dropdown to reveal a list of all your event types where you can select, or multiple select, individual event types to include in your report. This includes all venue types by default. Click the dropdown to reveal a list of all your event types where you can select, or multiple select, individual venue types to include in your report. If you have the waitlist when full option selected for events you can choose Yes to include these events or No to exclude them from the report. Fields available for Registered events reporting, what they do and their options. If questions are asked that need a response from the registration form they can be displayed with the answers using this field. By default all custom questions are included. Click on the dropdown to just select an individual custom question in your report. Choose to show the registrant's library card number. There is the option to type in a number to just include the registrant with that library card number. Include the number of guests a registrant has added. There is an option to type in a number and then select Equal to, Greater than or Less than. Include the age group of registrants. There is the option to type in an age group to just match and include registrants within that group. Include the email address of registrants. There is the option to type in an email address to just match and include registrants with that address. Include the name of the registrant. There is the option to type in a name to just match and include registrants with that name. Include the phone number of registrants. There is the option to type in a phone number to just match and include registrants with that number. Include the time that the registration was made. Fields available for Room booking reporting (Reserve), what they do and their options. Include the contact email address for the reservation There is the option to type in an email address to just match and include contacts with that address. Include the contact name for the room reservation. There is the option to type in a name to just match and include reservations with that name. Include the contact phone number for the room reservation. There is the option to type in a phone number to just match and include reservations with that number. The Creator field will include all library staff room reservers' names by default. Click the dropdown to reveal a list of all creator names where you can select, or multiple select, individual names to include in your report. The Date field will default to the current date. Use the date picker to select a date range for room reservations to include in your report. Include the display name the room reserver has added when booking the room. (This is the name displayed publicly in any room listings). There is the option to type in a name to just match and include reservations with that display name. This will include the room reservation end time. Include the number of attendees the reserver is expecting. There is an option to type in a number and then select Equal to, Greater than or Less than. Choose to include the Room reservation group's name. Include the room layout chosen for the room reservation. By default all chosen layout types are included, but click the dropdown and you can select or multiple select layout options to include in the report. The names of all reserved rooms are shown by default. Click the dropdown and you can select, or multiple select, room names to include in the report. The start time of the room reservation. The Status field will include all room reservation statuses by default. Click the dropdown to reveal a list of statuses where you can select, or multiple select, Awaiting approval, Approved, Declined and Canceled to include in your report. The type field will include all room reservation types statuses by default. Click the dropdown to reveal a list of statuses where you can select, or multiple select, Library event, Staff booking and Patron booking to include in your report. This will show all unmediated room bookings. Click the dropdown and choose No to exclude unmediated rooms.